In our last posting on the Jewish Legion we published this photo of the "Jewish Legion entering a Jewish village in the Land of Israel." 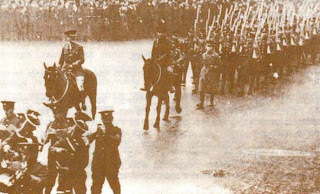 We have subsequently discovered more information about the photograph. 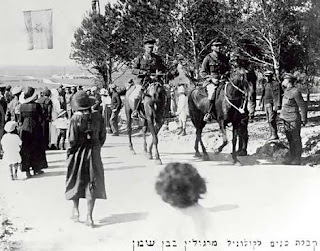 The picture shows Colonel Eliezer "Lazar" Margolin riding into Ben Shemen. Margolin, a Russian-Palestinian-Australian, was a decorated officer who succeeded John H. Patterson as the commander of the Jewish Legion. Margolin was born in Russia in 1874 and moved to a small farm in Rechovot Palestine with his parents when he was 17. He was proficient in Hebrew, Arabic, marksmanship and riding. Years later he was known as a figure who "rides his horse like a Bedouin, and shoots like an Englishman." Middle East. British Jews lined the route to cheer. back to fight the Turkish occupiers. He joined the Australian army in 1911 and fought with valor in Gallipoli (1915) and France (1916-17) where he was wounded. In 1918, Lieutenant-Colonel Margolin took command of the Jewish Legion and participated in the Palestine campaign against the Turks. 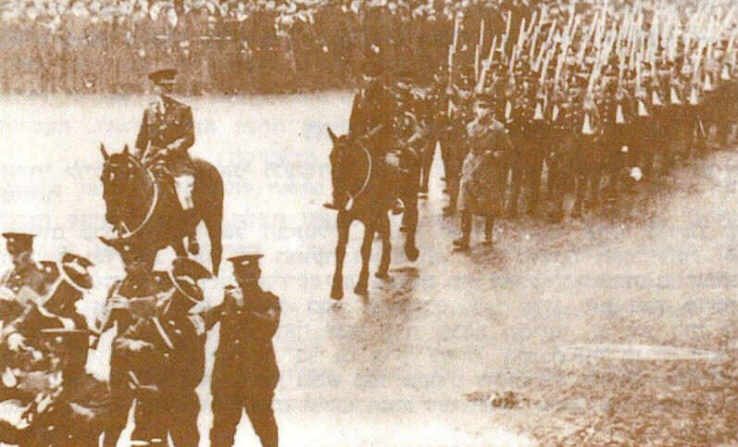 Just a few months after the Balfour Declaration in November 1917, a Jewish battalion of the Jewish Legion marched in London. Zev Jabotinsky, who had encouraged Margolin to take the command post, described the scene: "Tens of thousands of Jews crowded the streets, the windows, the balconies, the roofs. Blue-white flags were over every shop door; there were women crying for joy and old Jews with fluttering beards murmuring the prayer of thanksgiving: 'Blessed are Thou, O Lord our God, Who hast permitted us to live to see this day." Colonel Margolin's SOS to British headquarters for arms to defend the Jaffa Jews had been turned down. So, with his approval, fellow Legionnaires broke into the munitions depot, seized weapons, rushed to Jaffa where former Legionnaires joined them, and killed 16 Arabs and drove off hundreds. The Arabs had killed 27 Jews and wounded 106. The British declared martial law, and Margolin submitted his resignation. High Commissioner Herbert Samuel gave him two choices: to face a court-martial...or to leave Palestine immediately. Margolin chose to leave and returned to Australia.